A NEDO-supported consortium of Toshiba Energy Systems, Tohoku Electric Power and Iwatani Industry will establish by 2020 the “Fukushima Hydrogen Energy Research Field” which manufactures and supplies up to 900 tons of hydrogen annually generated by 10,000 kW hydrogen production equipment using adjacent photovoltaic power generation and grid power. The greatest challenge of this demonstration project will be to realize the optimum combination of production and storage of hydrogen. 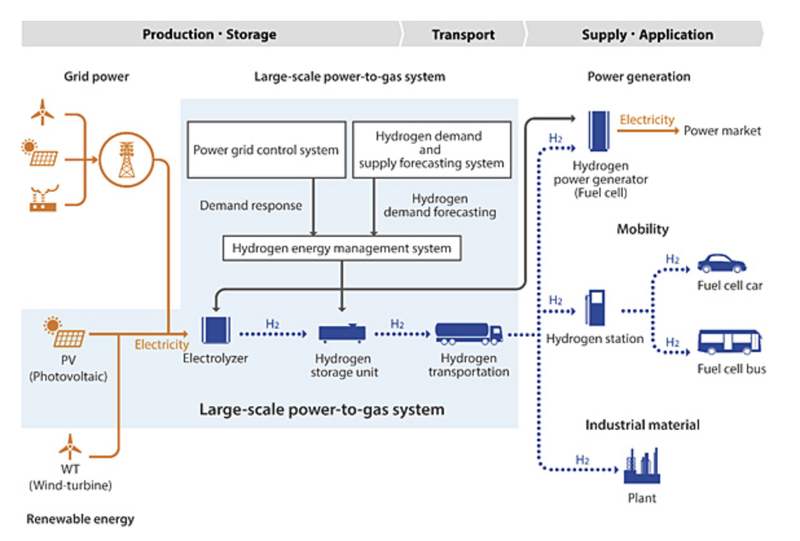 An optimal operation control technique combining demand response of electric power system and hydrogen demand/supply will be established. The hydrogen produced will be transported as compressed hydrogen by trailer and supplied to customers.